CS-STEM Network Certifications, a Carnegie Mellon recognized level of competency and knowledge, is now available for all users. Using an easy "Badges to Certification" approach, users can now narrow their focus that ultimately leads to a certification. As an educator, getting certified also means access to the CS-STEM Network system tools and activities, including automated assessments, virtual classrooms, and software, everything to evaluate student learning. CS-STEM Network certifications represent a standard level of competency and knowledge of a particular subject. Users can subscribe to a certification. which provides a collection of Badges, providing a clear pathway to earn the certification. Badges are smaller, more focused topics. A collection of specific badges builds up to a certification. However, users can also subscribe to badges individually. Progress made on those individual badges will automatically carry over to any certifications that carry those badges. Each badge has a number of requirements. 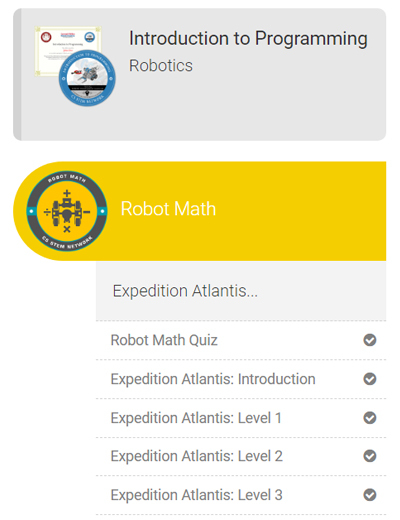 Requirements range from completing activities, viewing content, taking a quiz, and more. To earn the badge, all requirements must be completed. A Carnegie Mellon CS-STEM Certification course provides a teacher or administrator with evidence that the certified teacher has the necessary background to teach that particular CS-STEM subject area. Scaffolded from beginner through advanced levels, courses are designed to teach pedagogy, hardware, software, and troubleshooting techniques that teachers will need to implement a CS-STEM curriculum. They all emphasize how to foreground relevant academic concepts in each lesson. CS-STEM courses make connections for students to academic concepts and real-world applications by placing students in situations where they are solving real-world problems. Teachers that earn their certification can offer a Carnegie Mellon CS-STEM Certification course in their classroom and can take advantage of the automated assessment tools that are built into the course where applicable. All final assessments will be taken on the CS-STEM server. *Due to restrictions, CS-STEM Network Certifications and Badges are currently available to US and Canada users only. Whether you are an individual or an educator, anyone can obtain a CS-STEM Certifications. Most certifications are made available for everyone and self-paced, study at your own convenience. Earn badges as you study course materials, then take an online examination at the end.